Ski ALPIN CARD, Super Ski Card, 365 ALPIN CARDs and summer season tickets. Enjoy pure skiing pleasure on 200 days of skiing, on more than 2,700 piste kilometres, in Salzburg, parts of Tyrol, Styria, Carinthia, Upper Austria and Bavaria with 900 cable cars and lifts. Season ticket valid until May 1st! 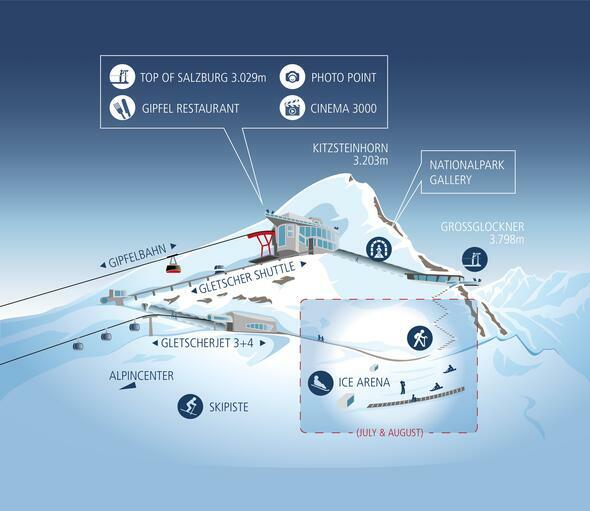 Season ticket for the Kitzsteinhorn and the Maiskogel in Kaprun, the Schmitten in Zell am See and the Skicircus Saalbach Hinterglemm Leogang Fieberbrunn. Season ticket valid until May 1st! Experience the unique mountain programme of the 3 top ski resorts without limits with 2 annual tickets! Enjoy winter sports and hiking with the 365 Classic ALPIN CARD and the endless all-year mountain package including paragliding and first-class biking programme with the 365 Action ALPIN CARD . Children born in or after 2014 or younger are transported free of charge if accompanied by an adult. Family bonus: Free season tickets for all children/youth (born 2001 or younger), if a family purchases two season tickets for the elder children, resp. for youth. Tax authorities validation of the family allowance is required. Hike ALPIN CARD's are only valid for the ascent and descent without ski equipment. The winter season ticket 2018/19 (season tickets 2018/19 bought at standard price for: Kitzsteinhorn-Kaprun, Zell am See, Saalbach Hinterglemm Leogang Fieberbrunn, Super Ski Card and Ski Alpin Card) can be extended against a surcharge for a season ticket.